In the cool shade of the park trees at Williamsburg, a decade or so ago, there gathered every day a group of men composed of the pioneers of the community and the ones who had seen the town grow from infancy to maturity and helped to promote its interests. These men met here and discussed affairs in general, often relative to the community problems. The townspeople gave them the name "Board of Trade" in a half- humorous way and by that cognomen they became known all over the county. 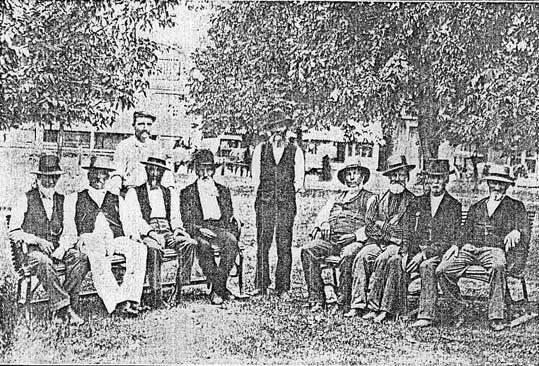 From left to right in the above picture the men are: David R. Evans, Benjamin Harris, William Jones, Owen Jones, Howell Williams and Robert Powell (standing), David T. Jones, David Davis, John Davis and David Roberts. All but two of these men are now dead.